It is that time of year where we in Lorraine start to collect ripe fruit and turn it into other things. People who follow me on twitter will know that I make Jam whenever possible, though I seldom eat Jam. Much of our Jam is given away to people who, we hope, eat Jam more often than we eat Jam, but many of them, I suspect, find that Jam is as adequate an unexpected gift as we do. And pass it on. Recently I sent a parcel of Jam to someone in England. But I suspect he might actually eat some of it. Or at least try one pot and then give the other one to a friend who, he has reason to suppose, likes Jam. One year in three or so, we have a very large crop of Mirabelles. The Mirabelle Plum (Prunus domestica subsp. syriaca) is the Patron Fruit of Lorraine. There are two main types, the Metz (which is sweeter and smaller) and the Nancy (which as it ripens develops an attractive "blush") on the yellow skin. We have two trees of the Nancy type. This year there were so many that several branches broke. So I made Jam. Quite a lot of Jam, actually. And there were still far too many mirabelles left. I wasn't going to make more jam, though. Too much like hard work. Making Jam is bad for my back. Only those who have made Jam will understand this. But I always make it while I can. I can't stand seeing good food go to waste, however, so in order to get at least some small benefit from the rest of the mirabelles, I filled up two 30 litre barrels with fruit, crushed it a little, and then sealed it up to let it ferment. Fermentation, like the Doppler Effect, is fabulously* simple. This is one of the reasons, along with preservation and, of course, alcohol, that fermentation is a source of joy. Plums ferment very readily, and will start fermenting as long as some (about half is more than enough) of the fruit are broken or damaged. What's wonderfully simple about fermentation is that all the ingredients are already there, on, in and about a single plum. Water, sugar, cellulose and yeast. If it's warm enough (we've had a couple of very mild weeks) it gets started on its own without any prompting. And what it does is magical in a number of ways. Everyone knows that it turns sugar into alcohol and for many that is understandably enough. But there are two byproducts of fermentation, and the other is carbon dioxide. CO2. Yes indeed, that most fashionable of world-eating industrial waste is produced in the creation of the one substance that reliably stops us worrying about it. However, CO2 is special because of two of its very simple qualities. It is heavier than air, and it suffocates all sorts of unwanted organisms. Consequently, it forms a layer on top of whatever is fermenting. This not only prevents mould, but it also suffocates small (and large**) insects and other invertebrates (there's a larval worm that gets into plums), and kills off all but the hardiest (and least harmful) bacteria. Yeast, in fact, creates an environment in which only it can thrive, by the very act of thriving in it. 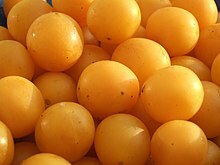 The major consequence for me is that my mirabelles are preserved in delicious drinkable and slightly intoxicating form. I do my best to regulate the alcohol to somewhere between 12% and about 18% but it's largely guesswork. Fermentation therefore magically and simply turns one thing into another; it takes fruit in which all kind of nasties may be living and turns it into a nutritious source of clean, safe water which has an impressively long shelf life. And mirabelle wine can be used as an alternative to white wine in cooking for a couple of years after it is no longer any good for drinking. If you are a student of medieval history you almost certainly already know that in the Middle Ages, beer was the only safe drink you could get in northern Europe. Wars were won and lost as a result of someone controlling the supply of beer. But dig down a little into the biochemistry of even a highly simplified model of fermentation and you soon find it is fiddly, complex and messy. It seems to follow a few basic principles, but the science behind those principles is annoyingly difficult to comprehend without a degree in biology. Thankfully, you don't need one to be able to make plum wine. This is where the tenuous link to writing is to be found. Everyone's best writing seems to come from a process much like a well established fermentation; once the writer is in full flow, it is much like the yeast creating ideal conditions for itself by profiting from ideal conditions; it's self perpetuating. When your writing is flowing well, you don't need to know all those grammar rules; you don't need to have your desk cluttered with plot diagrams and character development outlines, you don't need CMS open in front of you. When you're writing at your freest and fastest is also when you're writing at your best, and when your writing is the most you. You get the best fermentation, though, when you start from a very few ingredients that inevitably include everything needed to start a good fermentation, like a ripe plum. You can, you see, use various additives to start off, or to boost, fermentation. From one year to the next the size and sugar content of the plums can vary; changing atmospheric conditions can contribute to the amount of naturally occurring yeasts on the skins. The ambient temperature may be too low (or in some countries, too high). With a little study, you can compensate for this, and the fermentation will get started and proceed well. Sometimes, though, the end result is still undrinkably bitter or acidic. And sometimes, the only way you can correct this is by calling in a brewing expert who knows all about those horrible fiddly details in the biochemistry, and will tell you to, perhaps, mix two varieties of plum, or combine the natural yeasts with some shop bought freeze dried yeast of a particular variety in specific proportions. If you decide to sell your wine commercially, then you definitely need to call in an expert. But I didn't intend this as a post about how essential it is to get an editor. You all know that, anyway. What interests me is those sections of a book where I can see as I am reading that the writer has got the fermentation conditions just right; where she has been writing quickly but without rushing; where she has been playing with the language and having fun with vocabulary without it becoming awkward, pretentious or annoying; where there is a turn of phrase that somehow harmonizes with the actions, the themes, the symbolism. There is a special coincidence of ingredients that creates this kind of writing, and for me it is one of the things that distinguishes a writer from, for example, a story editor like myself. I can tell you what's wrong when it isn't working and I can tell you why it works when it does. And I can also help with the initial mix of ingredients that will lend itself to healthy, self-perpetuating fermentation. It distinguishes the writer because the writer is the person who can turn those ingredients into page after page of great writing. * regular readers may guess that I am using this word VERY precisely. ** e.g. wasps. Quite a few of them end up in the barrel.